In celebration of UCSD Athletics’ impeding move up to Division I, the FA18 robot contest is MAE 3 Sportsball! MAE 3 students will design robots capable of performing scoring actions of football, basketball, and soccer using sports balls (aka hacky sacks). Robots have the option of launching sports balls into a floor mounted area (soccer goal), into a short basketball hoop, or between vertical uprights (field goal). As the difficulty of scoring increases, the point value also increases! In professional sports, versatility has traditionally been a highly valued trait because of its rarity, and athletes that are good at multiple facets of a game become superstars. Examples of these superstars include Kobe Bryant (All-Defensive First Team and league scoring leader twice) and Babe Ruth (one of only two players to hit 15 home runs and pitch 50 innings in a season). But what if this versatility had to extend between multiple sports? Michael Jordan had an unparalleled professional basketball career but famously never progressed past the AA minor league level as a baseball player and returned to basketball. Deion Sanders was cut by multiple MLB teams, leaving him to finish his professional career as exclusively a football player. We are challenging the MAE 3 students to create robots that succeed where these players could not. Two robots will compete head-to-head for 60 seconds. Robots will try to score as many sportsballs as possible via field goal, basketball shot, or soccer goal. All scoring will be done at the completion of the contest after all parts have finished moving. Six sports balls (approximately 2.5" in length and 2 oz. in weight) start align along an edge of each team’s half. To score points, the sportsball must be COMPLETELY PAST ALL PLANES OF THE SELECTED SCORING AREA. This means no part of the sportsball can touch an imaginary plane upward from the walls of the basketball hoop, the post of the soccer goal, the cross bar of the football goal post etc. However, the sports balls can be piled higher than the walls of the basketball hoop, so long as none of the pile touches that imaginary plane. No defense is allowed in the air column above the basketball hoop (ie. no part of the defending robot can be in the air above the hoop). Not shown in the above figures are a container (net/box) behind the football goal posts to catch scored sportsballs. 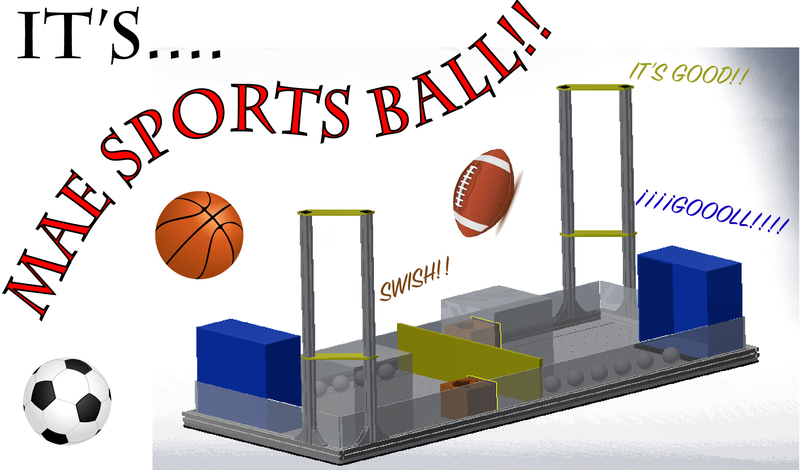 Robots must fit entirely within a 10x10x10in starting box at the start of the competition, but can be located in any position within the team's half of the of the field given that when the starting box is placed over the robot, no part of the starting box is touching the soccer goal, field goal posts, basketball hoop, center wall, or any of the sportsballs. Robots are allowed to cross into the opposing team's half of the table. HOWEVER: robots must return to their starting side of the table before the clock expires or they will suffer a 30 POINT DEDUCTION. In the case of a tie, the robot who scored more in the highest-weighted goals shall win (ex. a robot scoring 1x through the football goal post will have a tiebreaker over a robot scoring 4x in the basketball hoop). If that is not sufficient, the second tiebreaker is the team who scored the first sportsball wins!! Robot setup time on the contest table cannot exceed 2 minutes. Manufacturing variations will exist between playing fields. It is the team's responsibility to design a robot that will work on all contest tables. Each robot must only be built out of kit parts provided. Robots must be built in the Design Studio only using Design Studio tools. The disassembled robot must be able to fit in the team's locker, where it must be stored. Robots may be designed to interact. However, it is not in the spirit of the competition to intentionally damage another machine and no part of the kit may be used in a manner that is intended to cause harm. Any device which is designed to chop, break, or penetrate another machine will not be allowed to compete. If you think your machine may be at risk for violating this rule, ask early before you build it! Applying forces onto an opposing team’s robot that are large enough to break plastic pasts, while the opposing robot is in its starting area, will be deemed to be intentional harm to an opponent and can lead to disqualification. However, blocking other robots or pushing other robots while attempting to score will generally be considered legal. If any part of your robot is on the opponents side at the end of the competition you will be deducted 10 points. Robots will compete in a head-to-head competition. However, operation of the robot without an opponent will be an important part of the robot grade. Two Variable Voltage switches (0 to 5VDC) with a user controlled knob to adjust the voltage. Each switch is Double Pole Double Throw (DPDT) switches, which can operate a DC motor in either direction. Note the kit contains five DC motors and one solenoid, but only four user controlled switches. More than one electrical device can be connected to a single switch, but the voltage may drop if a large current draw is placed on the power supply. Use of motors, solenoids, and switches will be covered in lecture and is described in the course pack. Review the Power Supply and Multimeter Use carefully. Issues with the electrical power often occur with the Variable Voltage switches, since the maximum current output is less in these switches. The non-geared motors draw high current and startup problems may occur if multiple non-geared motors with high loads are tied to the variable voltage source! No foamcore in final robot (as stated in kit parts list). The wire and string are serve your self, but are limited in length as noted. The paper cover on the acrylic parts is not to be used as a separate part. If it is detached from the acrylic it must be discarded. Nuts, bolts, and washers included in the Design Studio bin. These include bolts from size 2 to size 10, and metric screws for mounting the motors. Only take nuts and bolts from the bin as you need them, and search through the spare bolt bin before taking more (we went through $1,500 in fasteners last year!). Adhesives; including hot melt glue, and acrylic adhesive. Tape used ONLY for electrical insulation. Lubricants used only to reduce friction within one's machine (not on the contest table). We have some extra material that can be used for experimentation. This material will be made available in the lab scrap bins. In addition each section tutor has access to a limited amount of replacement material for their section. If you need replacement parts, contact your tutor. Some replacement of "mistakes" made to kit parts will be available, but supplies are limited, and replacement is not guaranteed. Each team may have parts made in the Design Studio's 3D printers under the following guidelines. The combined volume of all 3D printed parts, may not exceed 50 cubic inches per team. Individual prints must fit within a 4x4x4in cube. Team members must create the CAD files for all 3D printed parts, except for gears, timing belt pulleys, and selected parts such that will be posted on the MAE3 webpage. Teams can experiment with 3D printing and parts that are not used on the robot will not count towards the team's total. However, priority to the 3D printer will go to students working during their section time and to teams which have not yet used to 3D printer as much. Use of the 3D printer may be heavy during the final weeks of the class, so do not count on readily available access at that point. The contest will be held during the MAE finals period and will be open to the public. The contest will be held in a single elimination fashion (like a tennis tournament). During the lab period of the last week of classes, each section will hold a section-wide contest. The results of this contest will be used to seed the placement of the final contest. Thus teams that perform better during their section contest will have statistically easier contests in the early rounds. Since the number of teams in the class will not be exactly a power of 2, the higher seeded teams may get a "bye" during the first round. If necessary "wild card" teams will be selected to have a second chance in the contest, to ensure that all pyramid spots are filled. Performance in the contest depends on numerous factors that do not relate to engineering quality of the robot, including driving skill and luck! Performance of the machine without an opponent. A video record of the robot performance at its best should be the team's oral presentation. Effective communication of the design (orally and in final reports). Documentation of the design process and justification of decisions made. Analysis of machine performance in the robot reports. A trophy will be presented to each member of the winning teams, and a number of machines will be selected for display in the Design Studio. Team members must work out among themselves who will keep the final machine (after their display period). Teams will post presentations and video of their robot on the class web page, which they can cherish forever. Electrical energy derived through the umbilical during the 60 seconds when the power supply is energized. The electrical connections will made to a single umbilical cord hung from above the table; one on each side of the table. The umbilical cord cannot be touched during the contest, and there will be some drag from the cable. Each machine must be designed to overcome this drag if necessary for motion of the machine. If requested a TA can ensure that the umbilical cable does not snag. Only the tools and machine equipment in the Design Studio can be used to build the robot. Judges and/or instructors will disqualify any device that appears to be a safety hazard. Any machine that has flying parts must notify opponents, and all contestants must wear safety glasses during the machine operation. If a projectile is used, for reasons of safety, it must have a frontal area greater than 2 inch squared. Contestants will randomly be assigned to start on either side of the playing field. A maximum set-up time of 2 minutes will be allowed at the contest table. A maximum of 1 minute will be allowed for removal of all parts of each machine after each contest. Operators may interact with their machine during a contest only through normal operation of the switch boxes (for example you cannot touch the machine with one's hands during operation). It is allowable to adjust the configuration of the machine between contests; for example adjusting the configuration to the side of the playing field the machine starts on. Each machine can only interact with the surface of the playing field and objects on the playing field. The judges will wait until all the playing pieces have stopped moving before determining the winner. Points will be awarded based upon the final location of the playing pieces, regardless of which machine moved them. A playing piece will be declared out-of-bounds if it is off the playing field and will be disqualified. "off the playing field" is defined as outside the footprint of the table and below the height of the surface of the table. Damaging the playing field or the control boxes may result in disqualification. Purposefully using the electrical cables for any purpose other than transmitting electricity is not allowed. Gaining traction by use of adhesives, or by abrading or breaking the surface of the playing field is not allowed. A machine may not contaminate with lubricant or other substance the playing field or an opponent's machine (internal lubrication of a machine is permissible). Kit materials may not be changed chemically. DC Motors may not be rewound. The paper that is attached to the acrylic in the kit cannot be used as a separate element in the machine. If any piece of paper is detached (even partially) from the acrylic it must be discarded. The insulation must remain on the electrical wire in the kit except where the wire end is attached to another component, and there up to 0.5” of insulating can be removed. The clear acrylic 0.25 thick is for testing. If you include any of this acrylic in your final machine, you must remove an equivalent amount of colored acrylic that was used in making the part. Cable ties (zip ties) can only be used for strain relief only. Machine advertisements and decorations must be of the nature that it does not offend any other students or audience participants (use common sense!). All rulings of the judges will be final.